Paper.. Embossing Folders..Border Punch SU. Hi Sylvie, what a lovely card. I love the way you have used the cuttlebug corners. Enjoy your weekend, I'm soo jealous. 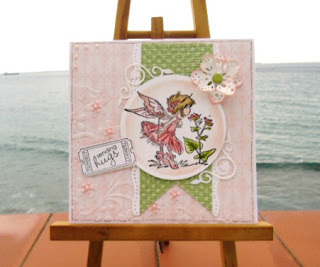 Your new blog friend Sue W.
Gorgeous card Sylvie just love these LOTV images..
Gorgeous Sylvie, beautiful PB image and colours. Gorgeous card Sylvie, I like the image and the great design. Wonderful take on our bright and sparkly theme Sylvie, such a sweet image coloured so beautifully, gorgeous papers and pretty details.